Maryanne’s musings: Wish I had more space sometimes. I put the frame in with just the eye because I wanted a pause. Also it’s sort of like he’s checking that nobody is watching him break from being noble and proud. 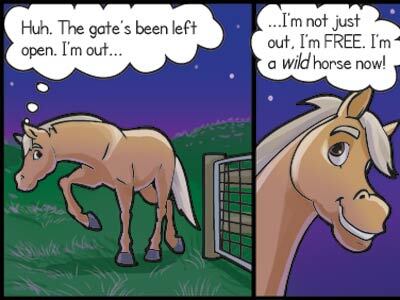 Then it ends with the horse not really knowing what wild is. It sort of comes from the way my horses put on a big prancing show and then instantly switch back to domestication once they see a food bucket.